KDI proudly manufactures custom cabinets in our Wyandotte warehouse. 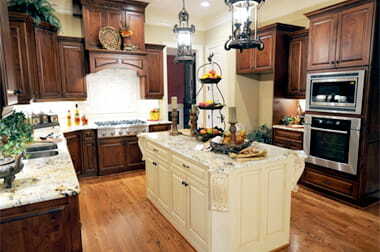 We have a wide selection of affordable cabinets and cabinetry. We provide countertop fabrication and cabinet installation for all styles of kitchens and bathrooms. Contact us for a comprehensive quote today. Get in touch with our professional design staff today for your dream kitchen or bath tomorrow. KDI offers a variety of kitchen cabinets, bathroom cabinets, media centers & home office cabinets, all at wholesale prices. When looking for quality wholesale cabinets, skip your big box store and check out KDI. We boast better products at better prices! We carry great brands such as Kountry Wood, Diamond, and Lafata and stock certain lines of cabinets so there is no delay in getting your project started. We can also deliver them to you! Visit our showroom in Trenton to see the full line of cabinets we offer at unbeatable pricing.